Today I’d like to share with you the recipe for THE only cake that I used to make when we lived in UK - my pre-baking years. If I remember correctly this was my cake of choice because it is an easy method and the recipe only requires one egg, something I rarely had in my kitchen. Oh, how things have changed. This year’s apple crop has been exceptional and having made plenty of chutney, my mincemeat for Christmas, my spicy apple cake and dried apples, I was looking for something different to do with them. This recipe seemed the obvious choice and it was just as delicious as I remember, plus the boys loved it. It may just be me, but I find the process of rubbing the flour and butter, plus the smell of baking to be quite comforting, especially this week, when there seems to be lots going on and my organisational skills are being stretched – if in doubt bake a cake! (Please note this can be made at any time of year, but my baking tends to be seasonally affected by what is overproducing in the garden). Line a loaf tin or 20 cm round cake tin with greaseproof paper and pre-heat the oven to gas mark 4. Sift the flour and baking powder into a bowl with the cold butter and rub together until mixture resembles bread-crumbs. 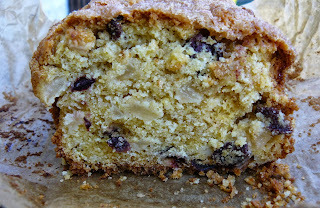 Peal, core and finely dice the apples and add to the mixture with the sugar and dried fruit. Mix in the beaten egg to form a soft dough, I find I need to add a little milk at this stage, but you don’t want too wet a consistency. Press into the cake tin and sprinkle with the Demerara sugar. Bake until risen and golden brown, which takes about 30 minutes in my oven. This is the perfect cake for an afternoon sit down with a cup of tea.